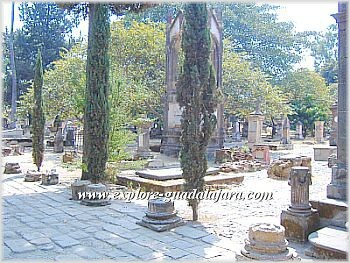 Here you will find more legends, experiences and scary ghost stories and myths from the Panteón de Belén cemetery in Guadalajara, Mexico submitted by visitors like you. If you have a story or interesting photo of a ghost in the Panteón de Belén please share it with us! We will post the best legends and photos with your name. If you would like to submit photos please contact us through this form first and we will tell you how to submit them. 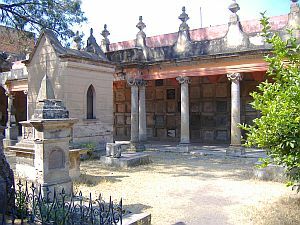 Please don't forget to visit our photo gallery of the Panteón de Belén and read up on more haunted cemetery stories that made this one the most well known in Mexico! It is said that in the Panteón de Belén there is a tomb called the Man of the dogs. This man owned many street dogs that followed him around. The man was killed one night and that same night his spirit was seen in a bar that he usually went to. Later, his dogs were heard barking nonstop and it is said that they were sad because their owner was killed. His body was buried in the Panteón de Belén and they say that if you scratch his tomb, you can hear his dogs barking. Story submitted by Rodrigo G.
One day I arrived home and my mother told me to sweep the second floor, but everything was totally dark. Only the moonlight entered into my mother's room. When I reached the room, I saw the shadow of a man passing through. After I saw him, I ran down the stairs screaming and yelling with the broom and dust pan still in my hands. I got downstairs and I told my mother what happened. She then told me that a few days earlier she felt the mysterious presence of something but couldn't tell what it was. From then on we started to feel that same presence almost daily. My grandmother told me that my uncle was once sick and treated at the Old Civil Hospital, which is right next to the Panteon de Belen. 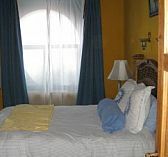 She noticed that at nighttime there was a tapping sound coming from the window of his room. For awhile, she thought that it was another patient on the other side making the noise. After several nights of hearing the tapping sound she started to get annoyed. One night she got a chair and put it close to the window and climbed up to see who was making all the noise. She looked out the window and saw nothing but the pitch black night and the empty Panteon de Belen. She also told me that they once tried to go to the Night tour of the Panteon around 6:30p or so, but they didn't want to stay because it was getting darker and they were too frightened. A woman appeared to me in my room in the Old Civil Hospital and told me she was buried in the Panteon de Belen. She asked if I would search for her body and said she was strangled to death. The Panteon de Belen is a popular spot to take wedding photos because it photographs so well. They say that while taking photos of recently wed couples by the Capilla de Vejación, at the bottom or in back of the couple you might see the ghost of a monk passing by. In his hand he carries a crucifix. Oddly, when a photo was taken once of a young couple, there were 2 cameras focused on the pair, however, the apparition of the monk was only seen on one of the photos taken. Some time later, another apparition was spotted by a young couple during a cemetery tour. The girl said she saw something strange pass by out of the corner of her eye. The young man went to check it out in the direction it was headed. As soon as he turned the corner he saw the figure of a monk with his head facing down and watched as the figure disappeared! Hey! 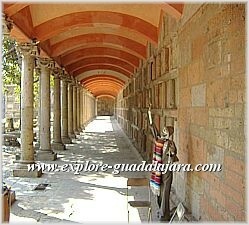 Don't forget to sign up for our free e-zine (The Guadalajara Explorer) to receive more traveling tips, fun updates, stories and more information on traveling to Guadalajara, Mexico. Sign up below! * Don't worry -- your e-mail address is totally secure. My friends told me that they took a night tour with their classmates. It was very dark and they were separated from their class and they soon got lost in the cemetery! They came across one of the groundskeepers and asked him to tell them where the entrance was because they were completely lost. He told them where to go and they parted ways. Unfortunately, the girls became more lost with his directions but eventually found the entrance and were happily reunited with their classmates. They spoke to a different groundskeeper there and told him that the other groundskeeper gave them confusing directions. The groundskeeper's face instantly paled and then he told them that he was the only one on duty that night! If you have any unusual videos, photos or stories about the Panteon de Belen please share them with us! Because of my experiences in the Panteon de Belen, I do believe in the ghost stories and legends there. I'm 18 years old and about 2 years ago I took a tour for the first time. I went in the morning with my cousin to buy tickets for the tour at nighttime. We took advantage of the day and decided to stay and look around and appreciate the tombs in the daylight. 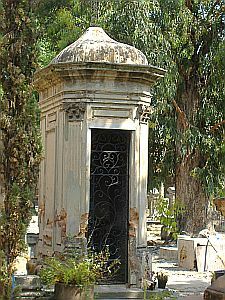 When we entered the cemetery, my cousin went to see the Vampire's tomb and I was interested in the Lover's tomb, which is almost in front. The weather was perfect, sunny and a little warm. I don't know why but I had a very strong urge to touch the tomb. As soon as I touched the tombstone it started to rain slowly and out of nowhere! I thought it was so strange. When I took my hand off it suddenly stopped raining! My cousin turned around startled, because it started to rain exactly when I touched the tomb. Later (during the night tour), we were by the tree where the boy committed suicide and while the guide was explaining what happened there, we heard the most terrible noise. It was extremely loud and was as if something very heavy had fallen from the tree right next to us (It sounded as if the branches moved when the object fell). Many of us in the tour jumped (there were about 15 people there) and when we shined our flashlights on the tree there was nothing there except the old stump. To this day, I don't know what had fallen. After this I returned again to the Panteon de Belen and something else happened. But that is for another story..
One day, a group of my friends and I went to the Panteon de Belen for a night tour. There were about 10 of us in the group and 2 of them said they didn't believe in ghosts and apparitions. They were laughing at everything and kept making snide remarks and jokes about the legends that the guide was telling us. We arrived at the tree stump (where the boy committed suicide) and the two people started cursing the legend and we just laughed. The next day, those two didn't show up for school and we were told that they were almost frightened to death in their own homes! We were told that when they went to their rooms they both saw the figure of a boy hanging from a noose. He told them both that he came to get them! After this, one of them went crazy and the other fell into a permanent coma. Message: Never laugh about the unknown because the same thing could happen to you. It is said that there was a young boy visiting the Panteon de Belen with his mother. The boy disrespectfully kicked an old skull and invited the deceased to his wedding one day when he grew up. The boy grew and became a man and on his wedding day he saw an elegantly dressed man and asked him who he was. The gentleman reminded the groom that they had met long ago in the cemetery and he invited him. When the groom remembered kicking the skull he had a massive heart attack and died shortly after. In the year 1990 we arrived at the front door of the Panteon de Belen and saw a man come out with a dog. He told us, "Come on in and I will tell you all the stories." The man finished with his stories and tour so we headed for the door to leave, when we turned around to say goodbye there was nobody there! Who was that man? Do you have some scary ghost stories to share or a photo of the Panteon de Belen? Share your scary ghost stories with us!